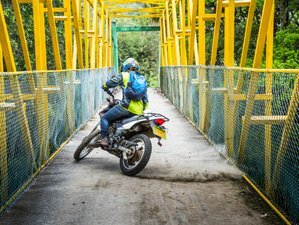 Join Adrenaline Addicts in this four days' trip along the northern coast of Colombia on Honda XR150 motorcycle! With the total of 19 hours of riding time, this tour will surely pump your adrenaline. Also, you can enjoy the breathtaking diversity of Colombia's north such as its jungles, deserts, beaches, and mountains. There will also be an excursion by foot into the end of Tayrona Park and Los Naranjos beach and you will be rewarded with a white sand beach, very rarely with anybody else around. Your accommodation will be shared dorms (four to eight beds) or you can choose to upgrade to private twin share or double / queen rooms. Drop Bear Hostel is like no other hostel, situated in rustic Colombian mansion that’s been given a new lease on life as a backpacker’s hostel. Thoughtfully planned out to accommodate every backpacker’s needs, the only danger is you’ll never want to leave. The hostel is perfectly designed and located for your stay in Santa Marta, only 5 minutes away from the city center by taxi, but far enough away to escape the heat and noise. Relax by the pool with a cocktail, chill in a hammock, or simply kick back on its stadium sofa to catch up on some Netflix. Proud winner of Hostelworld's best hostel in Colombia of 2018 and second best in Latin America, El Rio Hostel is nestled in the jungle alongside the Buritaca River. With its own private river beach, a riverside bar and sundeck, a host of nature activities nearby, and the Caribbean coast just a 30-minute walk away, El Rio Hostel is the ideal getaway for those looking to explore the wild side of Colombia. Located on the picturesque Caribbean coastline of Colombia, The Journey Hostel is not only the perfect base for visiting Tayrona National Park, Palomino, Costeño, and Punta Gallinas, but an idyllic backpackers’ paradise. Casas Viejas guesthouse is a place designed for travelers and nature lovers looking for an immersive and revitalizing experience in the mountains of the Colombian Caribbean. It is located in Finca La Victoria, a 500-hectare coffee farm founded in 1892, 20 kilometers from Santa Marta, and 30 minutes above Minca. In a cozy and friendly atmosphere, you are offered a comfortable accommodation, exquisite food, and diverse outdoor activities conceived to connect with nature and yourself. The tour is split into riding time on sealed roads and on either gravel trails or more intense off-road type paths through the mountains and jungle. The off-road sections contain river crossings, muddy sections, loose sand, rocky climbs, and grassy fields. Upon your arrival, you will spend the night at the onsite accommodation, the Drop Bear Hostel in Santa Marta. Adrenaline Addicts and you meet at their office at 09:00 and get everyone set up on their motorcycles, complete the safety briefing, finish the paperwork, and get everything strapped down on the bikes. Then, around 10:00, you set off down the coast. Today starts with some basic-intermediate riding around the Bonda, where you will have a quick stop off at a swimming hole before pushing on down the highway to Palomino for lunch. After lunch, you move further up the coast to El Rio Hostel, your accommodation for the night. At the hostel, Adrenaline Addicts provides drinks for an all-you-can-drink tubing ride through the jungle, which is the perfect way to get to know everybody in the group on the evening of the first day. You get up, have breakfast, and go on day 2, leaving your luggage behind and heading up into the Sierra Nevada mountains to tackle the Quebrada del Sol on an off-road trail. This is a four-hour loop that reaches 1,100 meters above sea level, crossing rivers, steep climbs, rocky embankments, grassy plains, and muddy stretches, as well as an indigenous village that you stop in for a short break and to have a look around. After finishing the loop, you come back out onto the main road for lunch at a local eatery, pick up your luggage from Rancho Relaxo, then head down the road to Quebrada Valencia waterfall to wash off the dirt and sweat before a short cruise down the coast to The Journey hostel, your boutique accommodation for the night. After breakfast at The Journey Hostel, you have an optional excursion by foot into the end of Tayrona Park and Los Naranjos beach. Monkeys are often seen on this 30-minute hike, and you will be rewarded with a white sand beach, very rarely with anybody else around. You hop back on the bikes and head out the back of the Paso del Mango area where you encounter some rocky climbs, deep river crossings, and winding gravel roads on the way to Caoba Biological Reserve for lunch. At Caoba, you will have a tour of the complex before lunch if time permits, seeing plants and animals from all over South America, before hopping on the bikes and taking the long way up to Minca, via a back road that few people know about. Then, you arrive at Casas Viejas, your accommodation for the night. It is perched up in the mountains of Minca in time for sunset and a couple of drinks before an early night to prepare for the following morning. You start the final morning with a bang. Rise and shine at 03:00 for the ascent to Cerro Kennedy, perched 3,200 meters above sea level, in the middle of the night. Lighting the road with nothing but the headlights from your bikes, you slow the pace a little and climb for two hours in the darkness to arrive in San Lorenzo for a jaw-dropping view of the rising sun. After the sun is up, you ride the final 20 minutes to Cerro Kennedy military base, the highest accessible point in Minca before turning around and heading back down to Casas Viejas for breakfast. After breakfast, some groups like to catch another hour or two of sleep, so when everybody is ready, you cruise back down the other side of the mountain, stopping in at a swimming hole and a local barbecue house for a late lunch. You will arrive back in Santa Marta around 15:00, dirty, tired, and sweaty, but with bright eyes and wide smiles, having bared witness to a side of Colombia that few people before you ever have. Sam is one of the founding members of Adrenaline Addicts. In 2014, he and Christian, the other founding member, departed on a round-the-world trip, intending to cross six continents in five years. He spent the first nine months of the trip on the north coast of Colombia, bought a motorbike and traveled as far south as Peru, then returned to the north with Christian, where they founded the company. Prior to starting Adrenaline Addicts, Sam worked as a motorcycle instructor in the United States for several years before combining that passion with his love of Colombia. Christian is the second founding member of Adrenaline Addicts. He traveled extensively throughout Colombia in 2014 and 2015 both together with Sam, and by himself, he worked for several adventure tour companies along the way before teaming back up with Sam in early 2016 to start the company. Prior to Adrenaline Addicts, Christian rode extensively around off-road and motocross trails throughout the United States, giving him a completely different riding background and skill set to his original business partner, complementing each other perfectly. Brayden is the third business partner of Adrenaline Addicts. In 2015, he traveled and worked as a volunteer in Peru and Ecuador, and he discovered a love for Latin America. He made plans to visit Colombia and started his own business. Brayden met Sam and Christian in late 2016, six months after the other two had begun operations. After he worked together for several months with Sam and Christian, the three made the decision to bring on Brayden as the third partner. Prior to joining Adrenaline Addicts, Brayden has ridden for almost 10 years in Australia, parts of Asia, and South America. This motorcycle tour will take place in Carribean Coast Region, Colombia. The food served will be a mixture of local, Colombian fare from roadside eateries that Adrenaline Addicts knows and trusts (usually lunch) and a mix of international cuisine at the hotels and hostels you stay. Vegetarian options are available at all meals. You will have an optional excursion by foot into the end of Tayrona Park and Los Naranjos beach. Please book your flight to arrive at Simón Bolívar International Airport (SMR). Adrenaline Addicts offers all-inclusive motorcycle tours of Colombia's Caribbean coast, desert, and mountains, from first-time street riders to motocross experts, they have you covered. Prices below are built based on a group of minimum 2 riders. If you wish to secure your spot and there are no other participants, the tour price will be 749 USD in a shared dorm (based on 1-rider group). Should you wish to allow other riders to join your tour, the cost per rider will be 619 USD and the organizer shall refund you the difference. If you wish to have a private tour, only for yourself (1 rider), the cost would be 749 USD. Kindly mention your request in your inquiry.